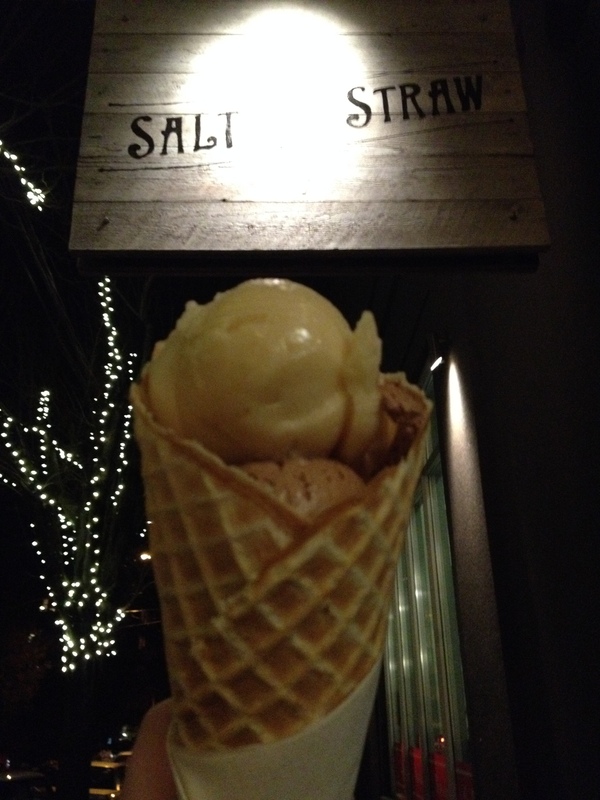 I know I just had Cider Month in October, but my favorite artisan ice creamery Salt and Straw has a Bushwhacker Spiced Cider Sorbet. As I’m sure you all remember, I visited the Bushwhacker tasting room for Ciderfest and it was fantastic! The sorbet was just as incredible. How could it not be? Mixing ice cream and booze is always a good combination. There is a crisp, coolness in the air that I finally realize I’ve been missing. It’s fall. It’s the season of scarves and boots, soups and tea, warm beds and cool rooms, squash and apples, orange, yellow, and red leaves crunching under your feet. If the seasons were kids, fall would be my favorite and all the other seasons would know it. If fall had a smell, it would be nutmeg. If fall had a flavor, it would be cider. What better month is there to taste a bunch of different cider? September is all about hanging out with new and old friends and grabbing a drink. I would love to tell you that the Oregon cider scene is where it’s at. Oregon does pretty much everything better than anyone else. We have the best food, and people, and craft beer, and art, and activities blah blah blah. We do not, unfortunately, have the best cider. Not yet, at least. The craft cider game has just begun to thrive in the Pacific NW. We cannot even compete with a company like Woodchuck, whose been pumping out incredible and innovative flavors for 23 years. My first Woodchuck flavor was Pumpkin. Buttery and sweet with just the right amount of savory pumpkin aftertaste. I could drink this as a meal, and then have another for dessert. Then I cracked open a bottle of Fall. It smells and tastes just like how you imagine it would. Nutmeg, cinnamon, oak, and apples. It is truly fall in a bottle… that gets you drunk. I also got the opportunity to visit a few local Oregon bottlers that are doing it right. Bushwackers is a small cider bar. They held a 3 year anniversary party marked with Ciderfest, a free event in the bar with tastings and music and food. They make their own, selling it by the pint or bottle, and they sell pretty much anything else you can imagine. Cold cases line the walls with bottled apples and fruit with brightly colored labels. Imports, exports, ridiculous ABV, super affordable to super fancy… how is a girl to choose? I also went to Hood River, to visit another local cidery called Fox Tail. They have a tasting room attached to their bottling plant, adjacent to a farm stand. The drive there was indescribably beautiful. The whole town of Hood River is like the best parts of small town downtowns. The picturesque views from the orchards and wineries, and mountains was breathtaking. The whole thing was freaking adorable, is what I’m saying. So, in closing out cider month, I’m thinking back at all the bottles consumed. What was my favorite might not be yours. If I like something sweeter like the Fox Barrel Blackberry Pear, you might like something a little more tart, like the Rhubarbarian. So, here’s my advice to you: Drink lots of cider. And if there is Woodchuck Fall or Pumpkin around, send it to me. Immediately.